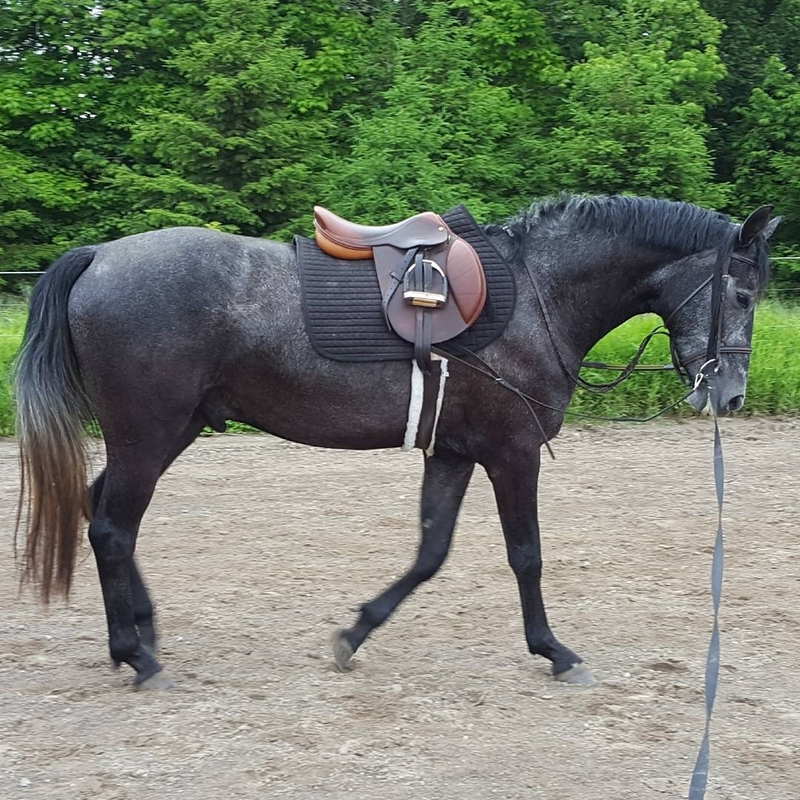 Stig is a three-year-old Hanoverian gelding who Jill purchased while he was still in-utero in 2014. He was born June 10, 2014. Jill plans to compete in Hunter/Jumpers with Stig. 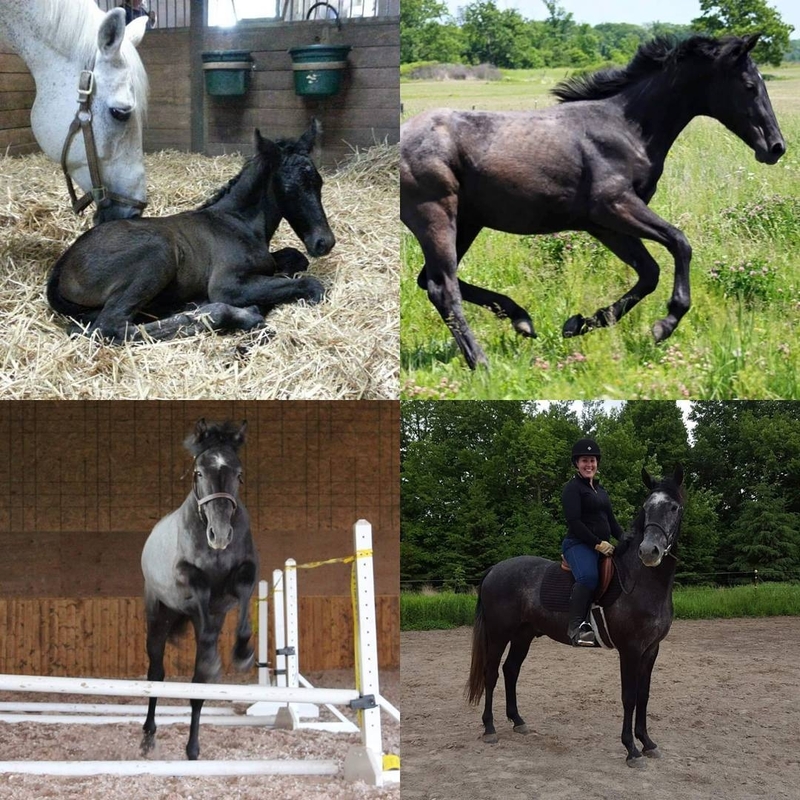 Following two months of professional training in April 2017, Stig was relocated to a small boarding stable near Jill, where he was turned out in a pasture with three other geldings. 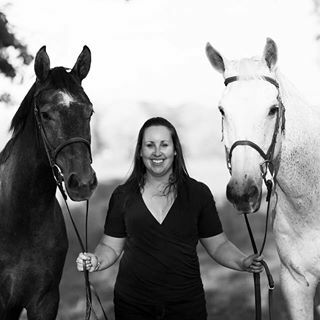 Late afternoon on June 30th, Jill received a call from the owner of the stable where Stig was kept. 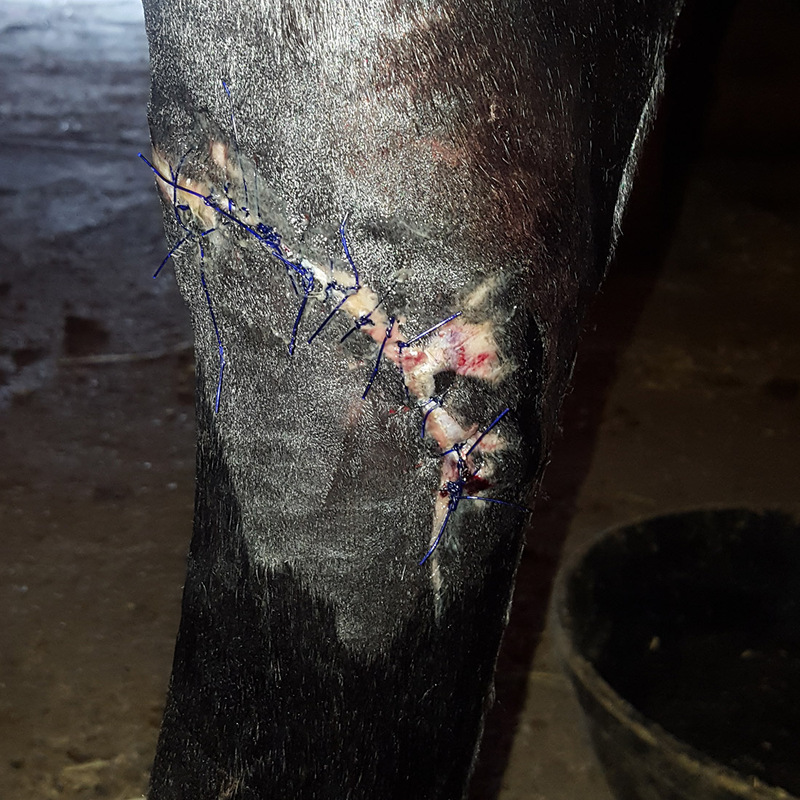 Somehow, while Stig was turned out in the pasture, he managed to get his right hindlimb caught in the electric fence wire. In the process, he tore open his leg. Since nobody at the stable actually witnessed Stig’s accident, it wasn’t clear exactly what happened. However, Jill suspects the following scenario: Stig was grazing near the electric fence and started kicking out to get a fly off. While kicking out, he managed to get his leg wrapped around the electrified wire. The shock from the wire would have caused him to struggle even harder, causing the wire to dig even further into his leg. Thankfully, since there were people at the barn during the incident, they were able to tend to it immediately. Both Jill and Dr. Stephanie Whalen from Troy Veterinary Services arrived at the stable within the hour. Upon Dr. Whalen arrival, she sedated Stig and proceeded to clean and debride the wound. Although the wound was quite severe, it wasn’t was bad as it could have been---for the laceration just missed a major artery. Thankfully Stig did not sever any tendons or ligaments. 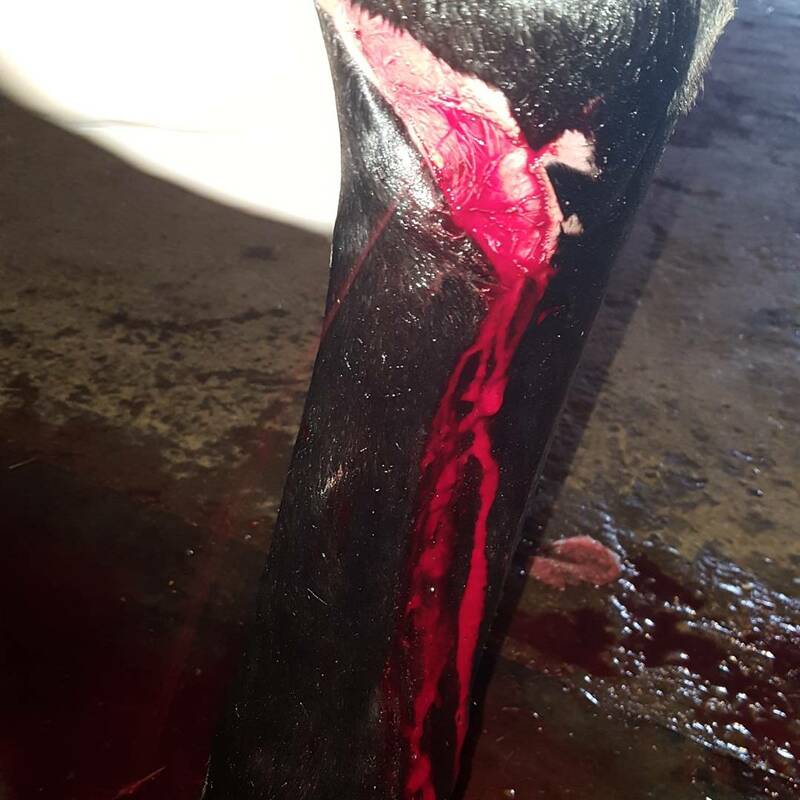 To evaluate whether the laceration communicated with the lower hock joints, Dr. Whalen injected saline solution to ensure it didn't seep out. After Dr. Whalen finished cleaning the wound, she administered a local anesthetic and stitched up his wound. 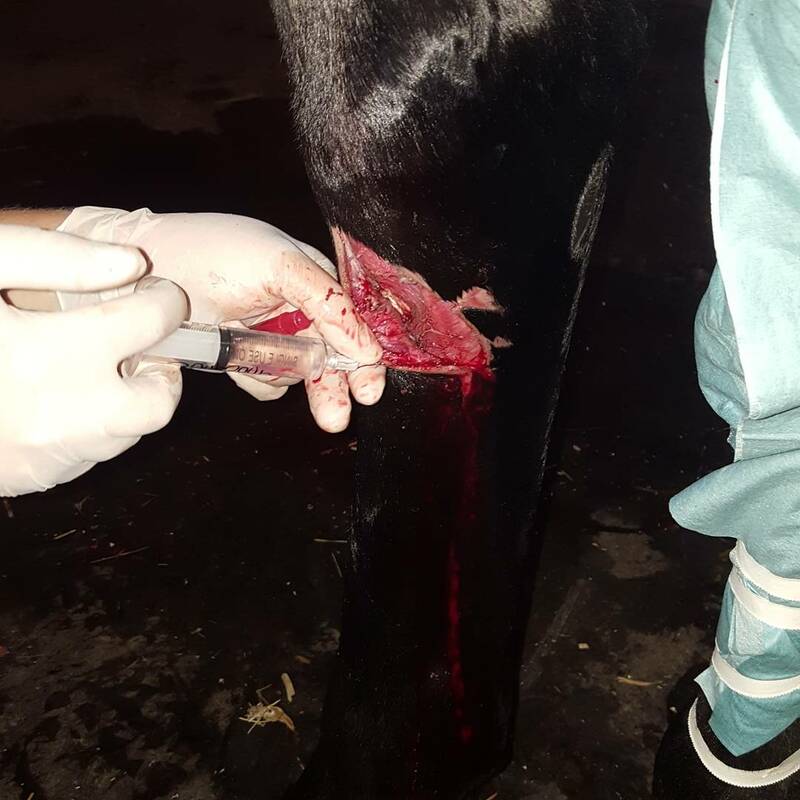 She cautioned Jill how since Stig’s wound was located directly on the lower hock joint, any major movements could cause the sutures to come out. After Dr. Whalen bandaged Stig’s injured leg, she administered a banamine injection to help with the pain. Bute: 2 scoops added to the feed, once a day for 5 days, then 1 scoop daily for 3 days. Uniprim: 2 scoops added to the feed, twice a day for 5 days. Apply Derma-gel directly on top of the sutures. Apply a Non-stick Telfa pad. Hold in place with conform gauze rolls. Wrap with a layer of brown gauze. Seal both ends with sticky Elastoplast. On July 6th (Day 6 post-injury), as Jill was bandaging Stig’s leg, she noticed that a few of the stitches were starting to rip out. 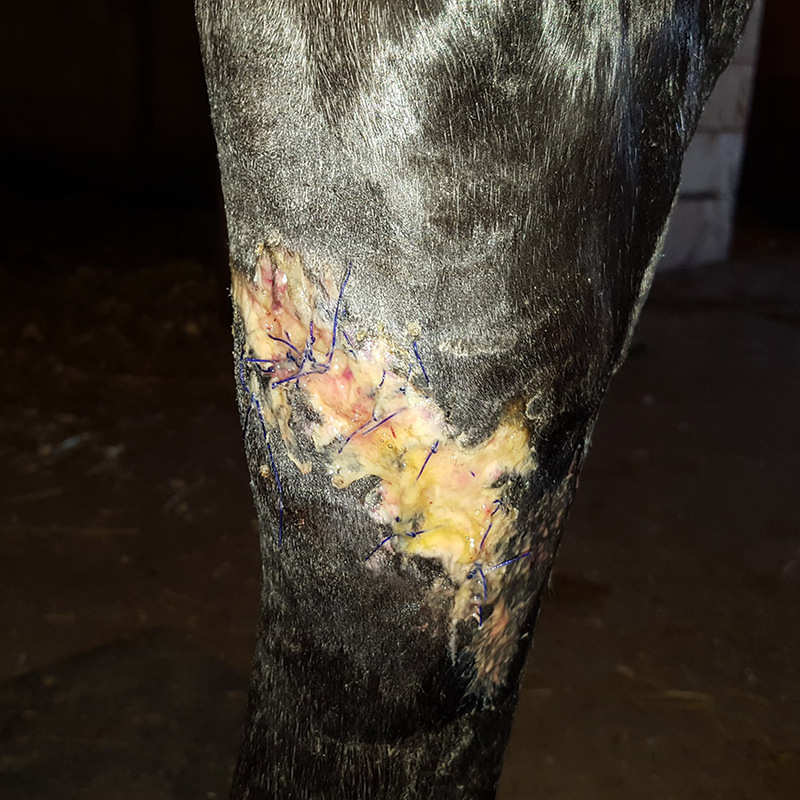 The next day, as she took off Stig’s bandage, she noticed that a good majority of the sutures were ripped open, and there was a lot more discharge coming from the wound than normal. Jill called Dr. Whalen and told her about the sutures. Apply directly over Stig’s wound. 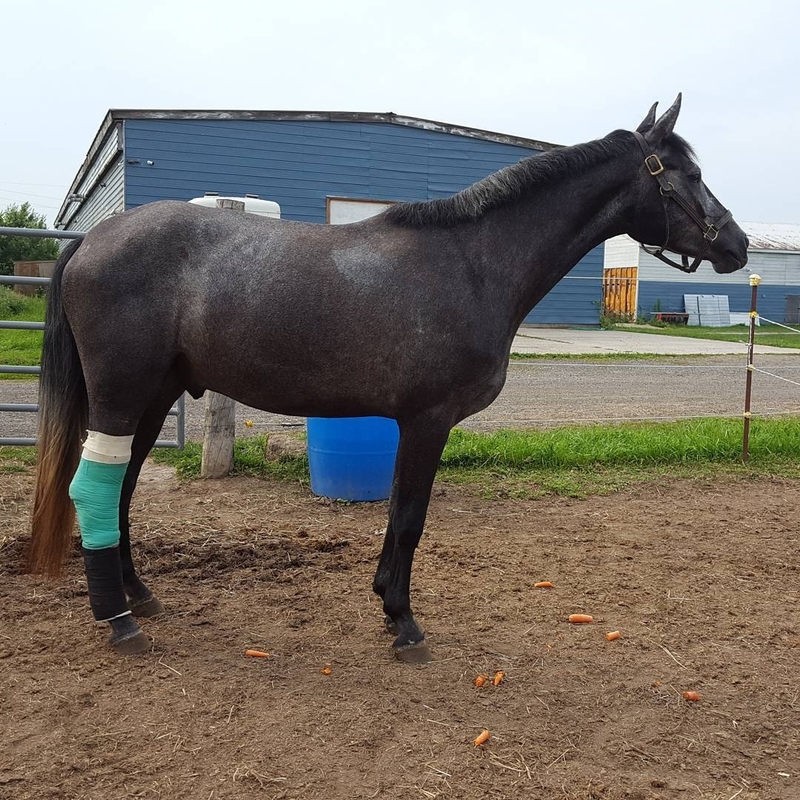 Jill wrapped Stig’s leg using the “wet to dry” bandage for 3 days over the weekend. She noticed how each day there was less and less discharge coming from the wound. 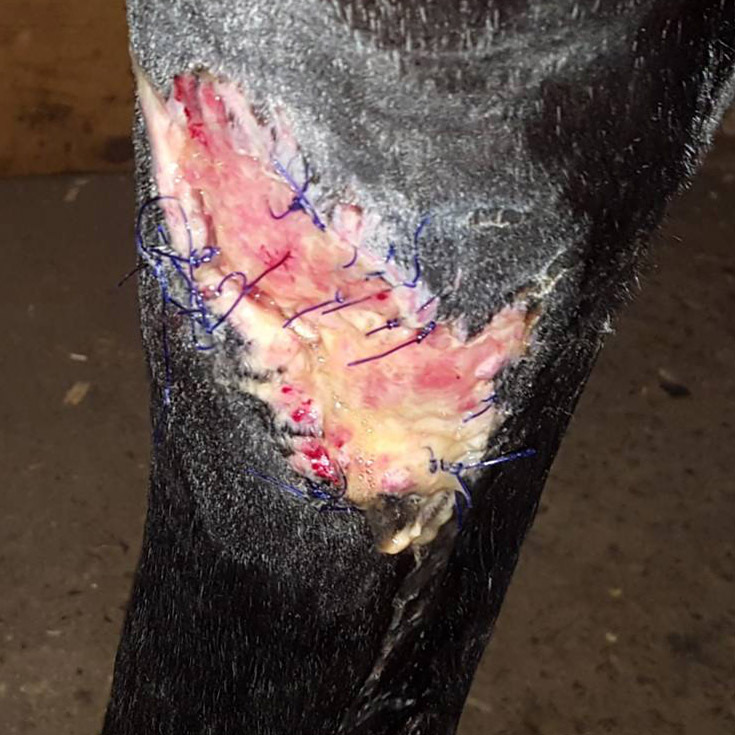 Dr. Whalen indicated that would come out early the following week and check on how Stig’s wound was healing. On July 10th (Day 10 post injury), Stig had his recheck appointment with Dr. Whalen. Upon arrival, she examined Stig’s leg and discussed different options for treating his wound moving forward. 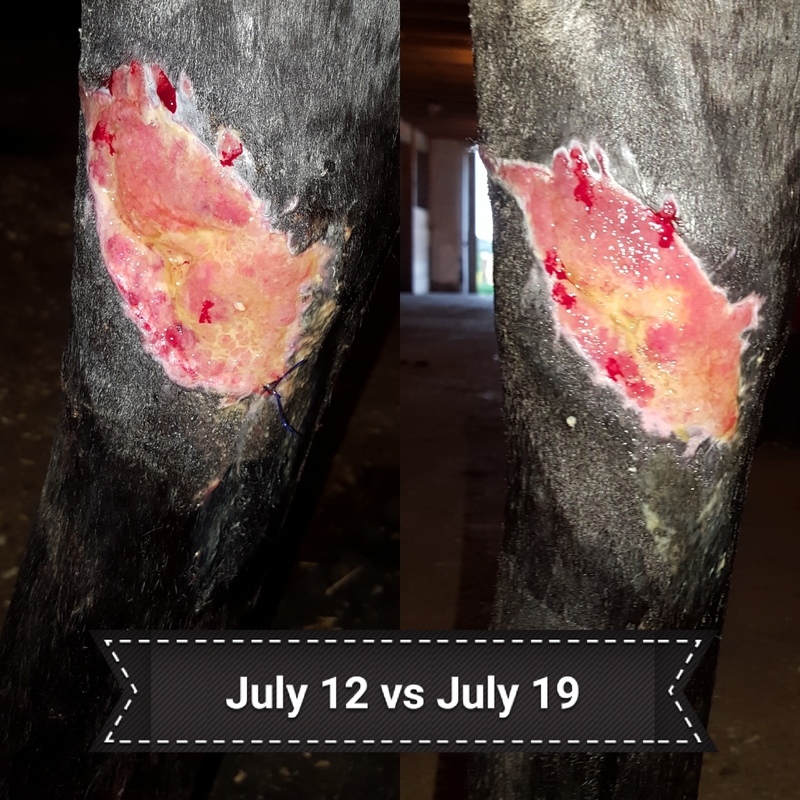 Dr. Whalen suggested cold laser therapy----which is a non-invasive treatment that uses low-level light energy to help speed up wound healing and minimize the growth of proud flesh. Jill agreed to try out the cold laser therapy sessions with Stig. 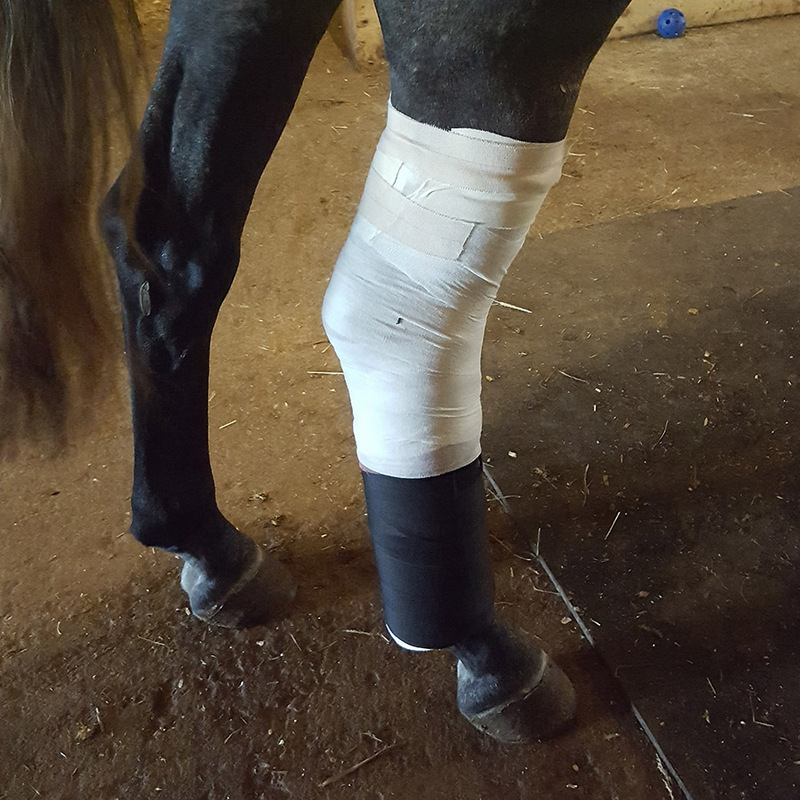 She also asked Dr. Whalen about the use of honey as a bandage dressing, for a friend of hers had used it for treating her horse’s lower limb injury and found great success. Dr. Whalen agreed that it could be useful, and advised Jill to switch from the previously used derma-gel, to applying manuka honey directly over the wound. July 12th (Day 12 post injury), Stig started his first laser therapy session with Dr. Whalen. The duration of each session was less than 5 minutes. 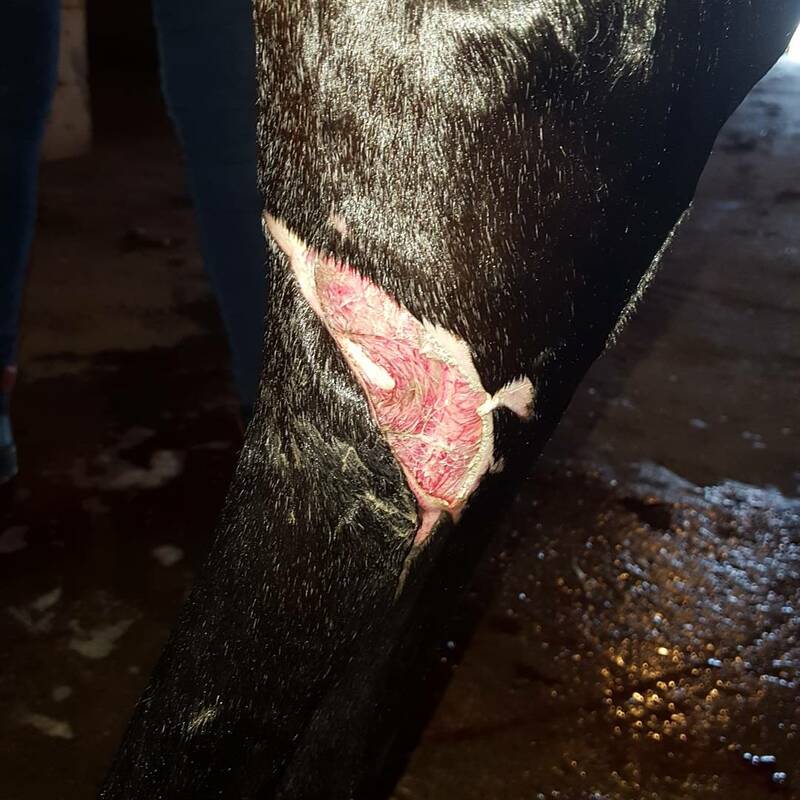 Dr. Whalen held the laser a couple centimeters away from Stig’s wound, and would slowly move it around to cover the entire area. She spent additional time over some of the larger, deeper areas of the wound. Dr. Whalen explained to Jill that Stig couldn’t really feel anything during the treatment---at most, a slight warming sensation. She then demonstrated this on Jill’s hand. Jill could barely feel any warmth whatsoever. The first three laser therapy sessions were every other day, which then became a daily occurrence. Dr. Whalen sold the therapy sessions as a package of 6 treatments, which were considered to be ‘one round’. Stig had ‘two rounds’ (12 therapy sessions) total to treat his wound. Since the stitches didn't hold, we're trying a new approach to healing Stig's leg. Snipped away some tissue not growing back properly, cleaned it up, using cold laser therapy, and then rebandaging with manuka honey! Fingers crossed this works. It was hard for Jill to see any changes to the wound while looking at it on a day to day basis. 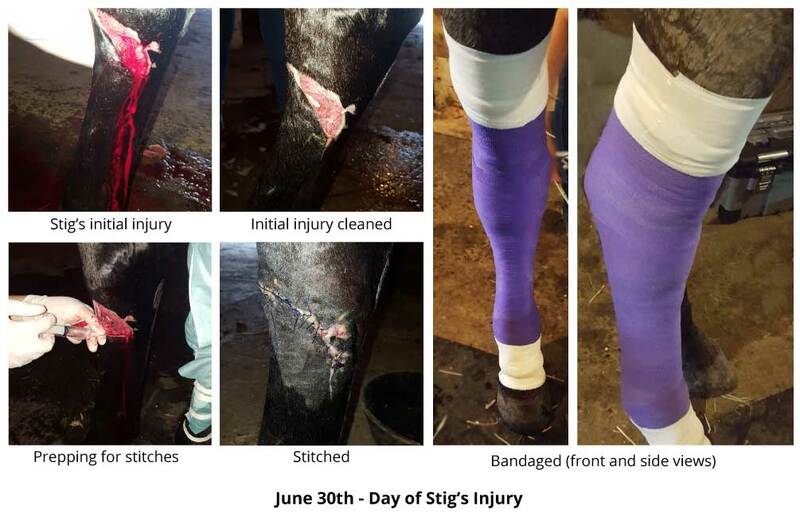 Thankfully, since she took daily photos of Stig’s wound, when looking back at the photos it was much easier for her to see the different stages of healing. 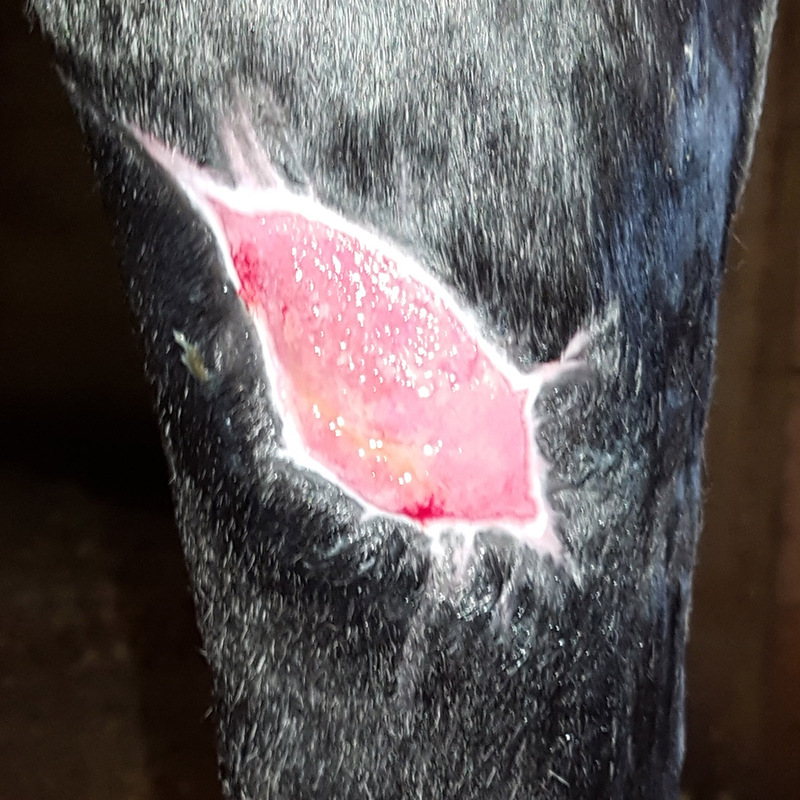 After just ‘one round’ of laser treatments, which took place over a course of a week, the granulation tissue in the wound was filling in well, had a healthy pink color, and minimal discharge. The best news was that no proud flesh was forming either. The Derma gel was replaced with raw, unpasteurized honey (applied directly to the wound). For the lower portion of Stig’s leg, the thick cotton padding and brown gauze were replaced with a normal standing wrap (using a leg wrap and leg pad). 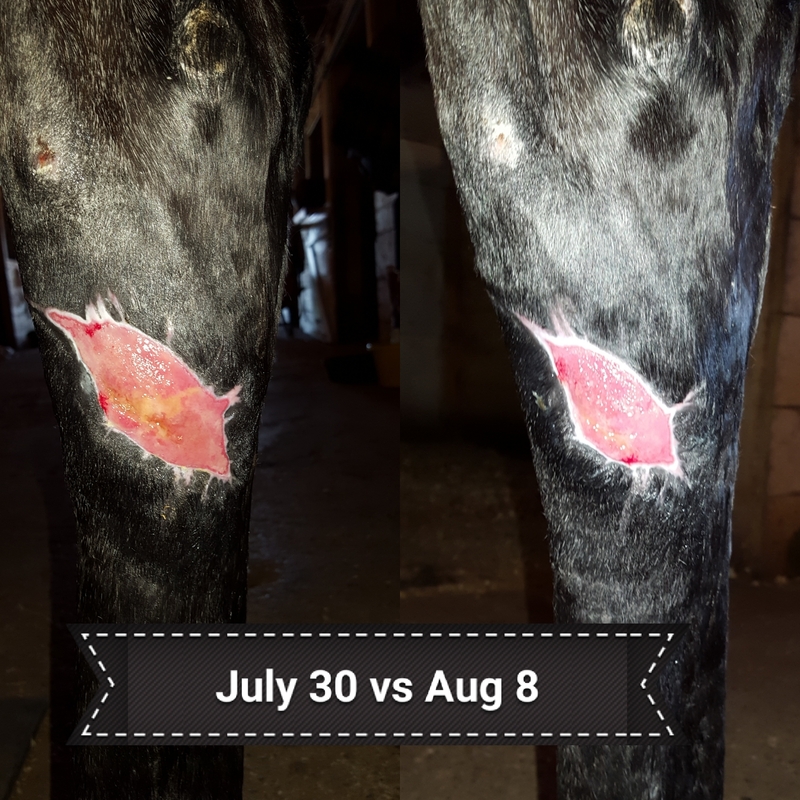 Since Jill and Dr. Whalen were so impressed by the fast rate of healing demonstrated in Stig’s wound, after just one week of laser therapy sessions, they decided to do a second round of sessions. 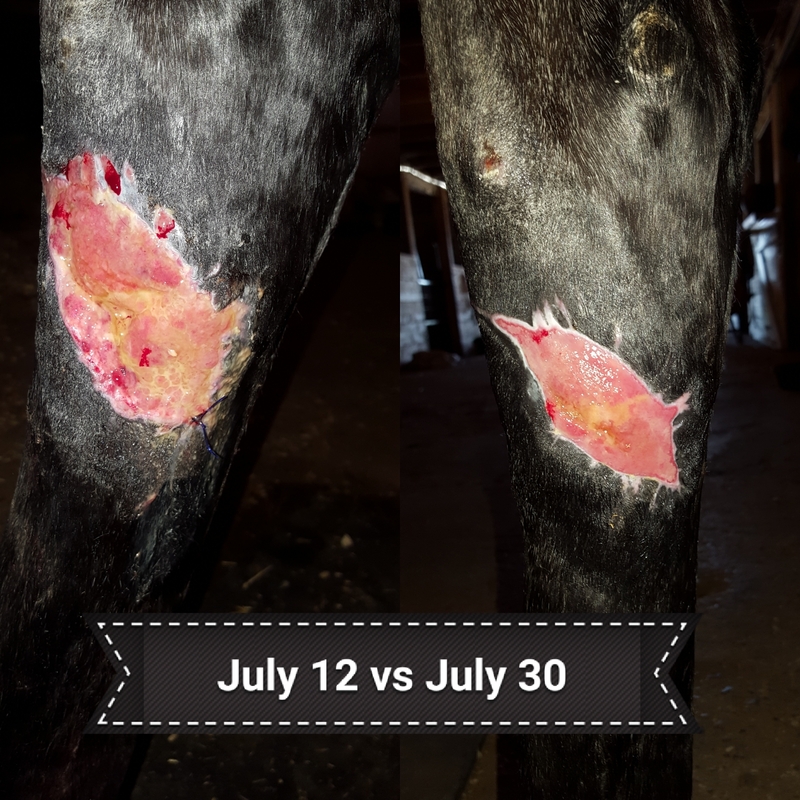 However, just before beginning the second round, Dr. Whalen ended up having to debride the top layer of granulation tissue in the wound, since the tissue wasn’t growing back quite as nicely as they had hoped (being that Jill planned for Stig to be a future show horse, she wanted to try to minimize risk of permanent scarring to his leg). The second round of laser treatments were completed over the course of a week. However, this time around, Stig was starting to act up a bit, and Dr. Whalen ended up having to sedate him for the last 3 sessions. 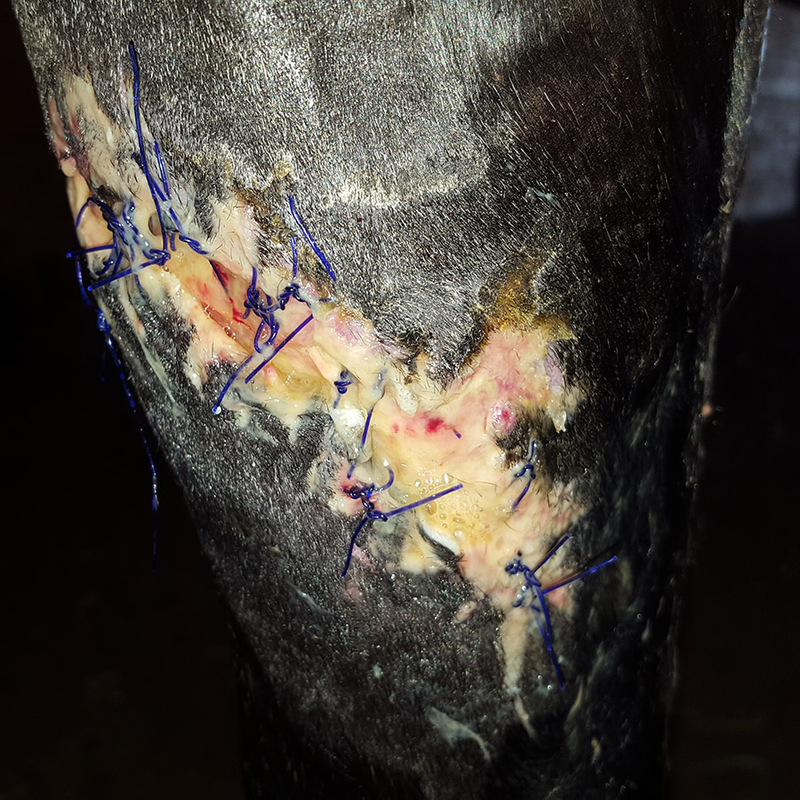 Dr. Whalen expressed to Jill how pleased she was with how great Stig’s wound was healing, and that it was filling in really well with healthy granulation tissue. Dr. Whalen was most happy about the lack of proud flesh growth, for normally she would have already cut it away 2 to 3 times. In Stig’s case, she only had to once. Upon completion of the second round of laser treatments, Jill and Dr. Whalen decided to give Stig a break from the sessions, since he was starting to act up. At this point, Dr. Whalen recommended that for the next week, to start hand-grazing Stig for 20 minutes daily. Before taking him outside, Jill gave him a light sedative (3 cc of Acepromazine (Ace) orally), to help ensure he stayed quiet and to limit his movements. Some days they made it the full 20 minutes, but others ended up being less due to Stig getting a little too excited. After a week of hand grazing, Stig was able to start getting turned out in for an hour each day in a small recovery paddock (while lightly sedated and with his leg still bandaged). 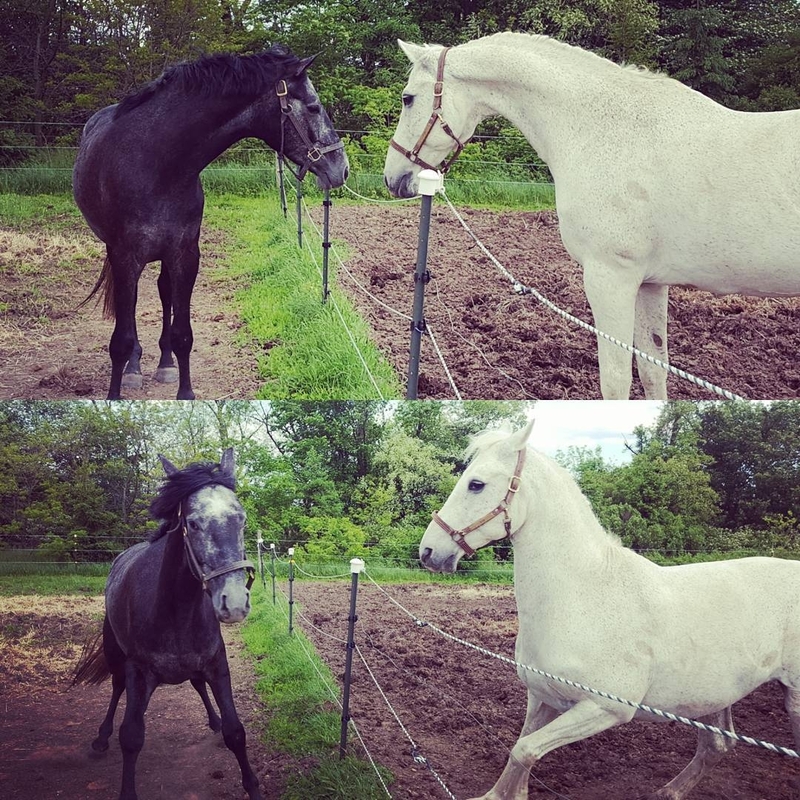 August 3rd was Stig's first day of turnout. 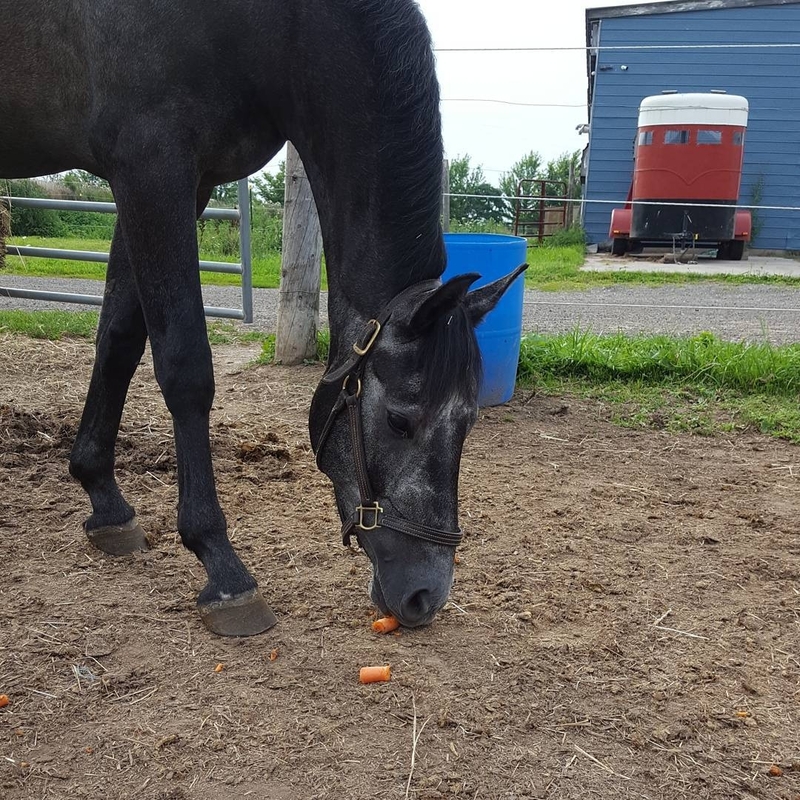 In an attempt to help keep him occupied during turnout (to help minimize the risk of him running around), Jill throw out small carrot bits throughout the ground of the paddock---for him to have to search for them. The search for food game helped for the most part. After Stig came in from his daily turnout sessions, Jill changed his bandage. Throughout the entire injury event, Stig was never once lame. 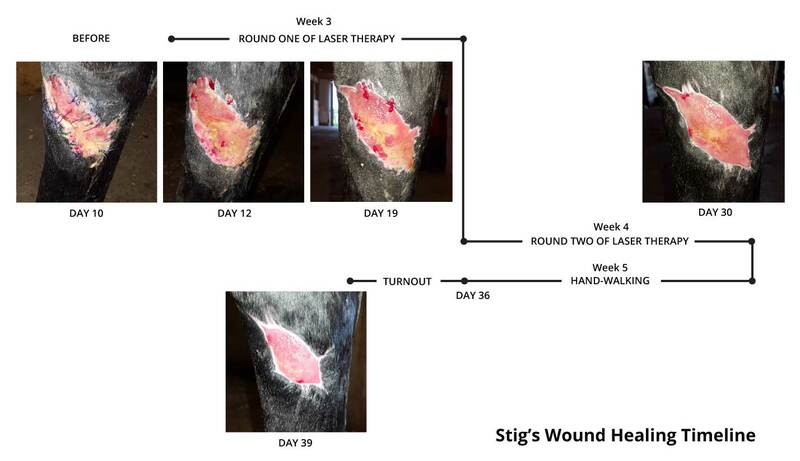 Since Stig has started daily turnout, and is no longer receiving laser treatment, the rate of wound healing has slowed down. 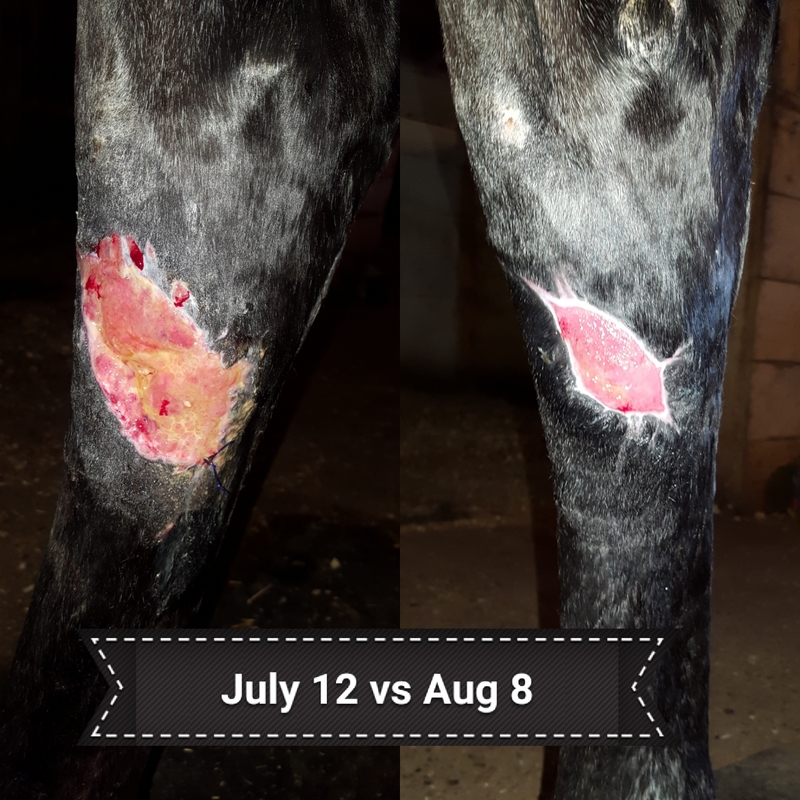 On August 9th (Day 40 Post Injury), Dr. Whalen came out for recheck appointment to evaluate how Stig’s wound was healing. She expressed to Jill how pleased she was with the way the wound looked since their last laser appointment (2 weeks earlier). 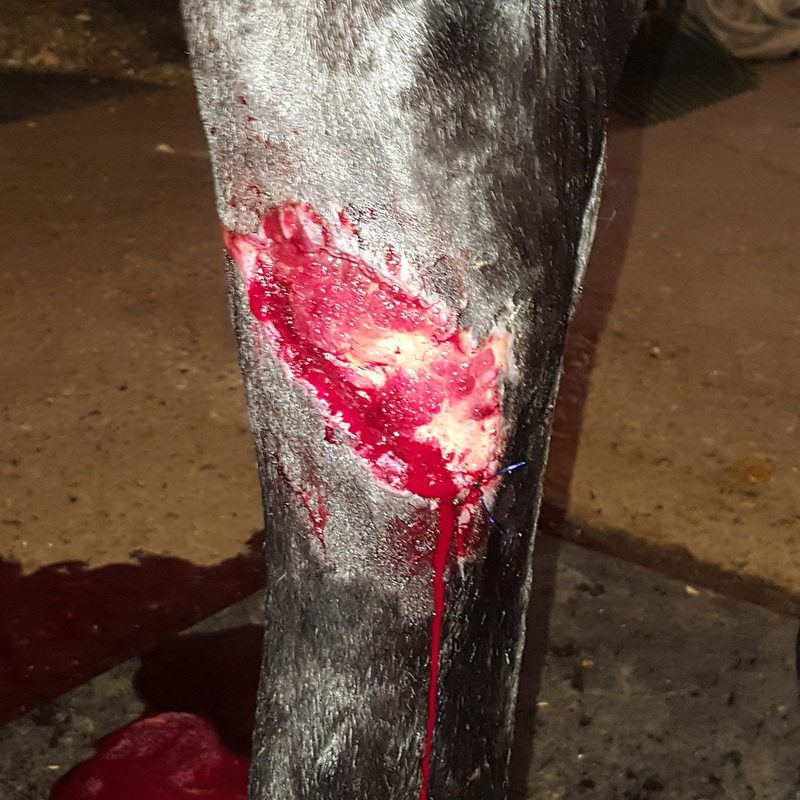 The wound was filling in well with healthy granulation tissue, continuing to contract, and showed no signs of proud flesh forming. 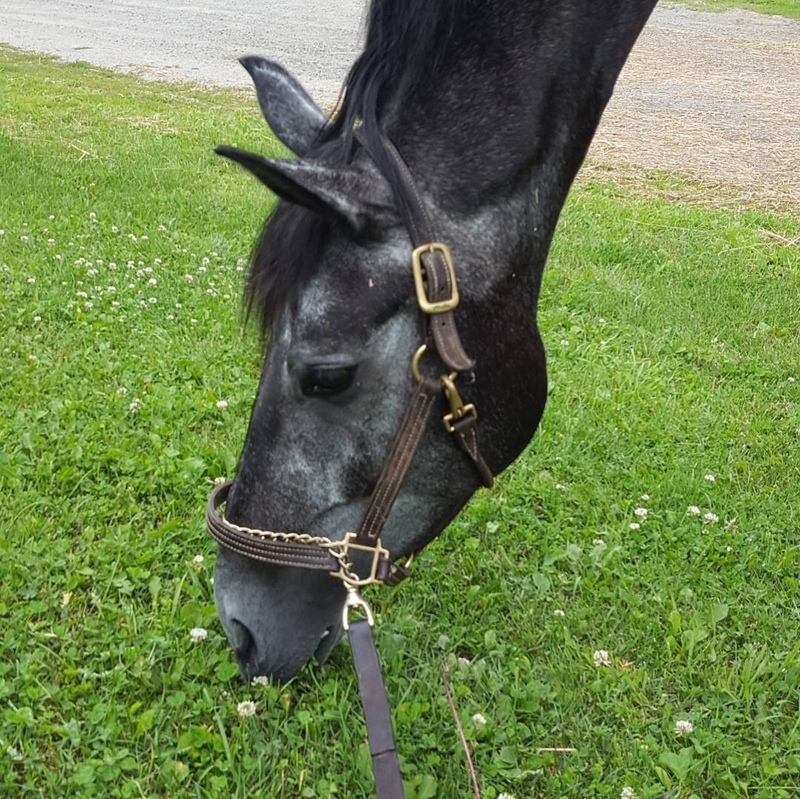 Dr. Whalen recommended that the duration of Stig’s daily turnout in the small paddock be increased to 2-3 hours and for Jill to begin lunging him at the walk. Jill also needed to continue with daily bandage changes. Dr. Whalen would come out for another recheck appointment in one week. Depending on how the wound looked at the next appointment, they would change Stig’s bandage to a lighter, less restrictive material and Jill could start riding him again at a walk. Stig could return to full-day turnout. Jill could start riding him again. They would need to proceed slowly though, and gradually build their way back up. Jill no longer needed to wrap his leg; however, the wound should be covered with Stalosan. Stalosan is a clay-like cream which dries once applied, forming a protective barrier over the wound. It could stay on for several days, and Jill could simply touch it up as needed. Every 3 or 4 days she would need to completely wash it off so she could inspect Stig’s wound, to ensure it was still healing well and that there was no proud flesh growth. Jill quickly found that when she didn’t wrap Stig’s leg, that it would immediately swell up. Therefore, she had to put it back on again, and wean him off of it slowly. Since she still has to wrap the leg, Jill is covering the wound itself with honey, a non-stick pad, cotton gauze roll, and vet wrap (minus the thick cotton layer). 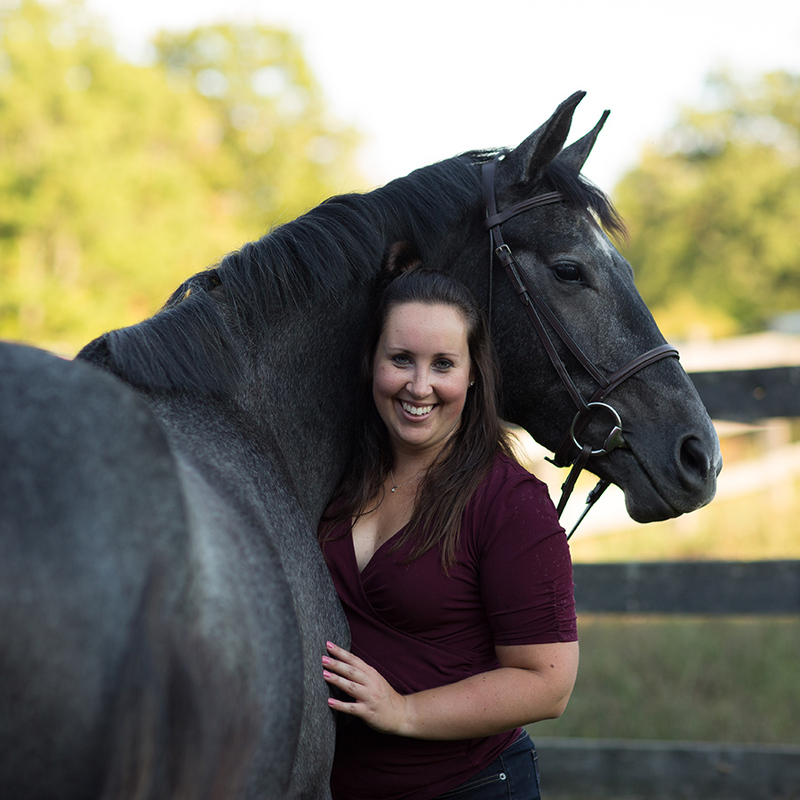 Troy Veterinary Services, located in Flamborough, Ontario, provides comprehensive veterinary care to both equine and companion animals. The practice was established in 2006. They provide preventative, medical, surgical, and emergency veterinary care.